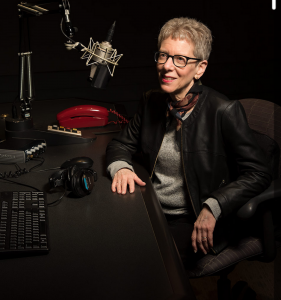 Terry Gross of Fresh Air! “Fresh Air’s Terri Gross began producing and hosting Fresh Air in 1975, shortly after being asked by former WBFO program director David Karpoff to come work with him at WHYY in Philadelphia. The show became nationally syndicated by NPR in 1985, and now reaches in the neighborhood of 5 million listeners every week. To date, Gross has conducted more than 13,000 interviews. For more than 40 years, you’ve been in very unusual position of asking very intimate questions about the work and lives of people you don’t really know. What has doing that over and over and over again taught you about yourself? I’m probably just revealing my own neuroses here, but it sure seems that when people are presented with two pieces of information — one negative and one positive — the negative one almost always gets a lot more attention. What’s the function? (of an interview)I like to quote John Updike on this. In his memoir, Self-Consciousness, which I really love, he said he wanted to use his life as “a specimen life, representative in its odd uniqueness of all the oddly unique lives in this world.” That’s kind of how I see interviews. When you’re talking to an artist, you can get insight into the sensibility that created his or her art and into the life that shaped that sensibility. I love making those connections. I think we all feel very alone. I don’t mean that we don’t have friends or lovers but that deep at our core we all have loneliness. So what need did Fresh Air fill in your life? Why did you want it so badly? When I was in high school I wanted to write. And when I got to college, I still wanted to write but I was discouraged really quickly because, well, I had two freshman English teachers, and one of them thought that something I wrote was really great. He said something like, “This is the kind of language that can shatter.” My heart swelled. I was so excited. But then my other teacher said, “Okay, for your assignment, just write something and bring it in.” And I thought, Write what? I don’t have stories that just come to me. So I went up to this teacher after class and I said, “I don’t know what to write about.” He looked at me kind of smirky and said, “Write a love story.” I thought, That’s about the last thing I’d write. He’s just saying that because he thinks women should write love stories. He’s not the type who’d be reading love stories probably. It was so dismissive. I was discouraged really easily, I guess. But, also, I just didn’t think I was good enough to be writer. I didn’t feel desperate enough to pursue writing, but I desperately wanted to pursue something that I could be passionate about and when I stumbled into public radio, I found that thing. How does your work spill over into your personal life? And I mean more from a psychical rather than practical perspective. How does having deep conversations day after day affect you? I just asked about how your work spills into your personal life and you gave an answer that was only about your work. Oh! I’m not going to make the case that I’m a great interviewee! I wasn’t intentionally avoiding the question. I was just going on a tangent. Maybe you were unconsciously avoiding it. No, no. I’m happy to address the subject. What I was saying actually connects to your connection. In real life, you’ll run into someone on the street and say, “Hi, how are you?” and seven minutes later they’re still telling you. So I’ve gotten practice with asking people in a nice way to stop talking. Some people act like they’re a late-night radio host alone in the studio and they’re rapping out loud to an audience that has no ability to talk back. I don’t want to be in that audience. I want people to talk with me, not to me. Ellen: I am busy writing a script for 2 presentations for It’s Sew Easy on PBS TV. I hope my scripts show passionate I am about sewing, and teaching other people how to make glorious clothes. I hope my script feels like I am talking to the viewer, not at them. And finally, I hope my insecurities at being taped for video don’t come through!